The music of Colombia is as unique as the geographical layout of the country itself. Having two distinct coastal expanses divided by the Isthmus of Panama, the Caribbean or eastern Atlantic region, and the western Pacific region; each offering a diverse blend of musical styles and rhythms, representing the Spanish, African, and Indigenous cultures prevalent in the area. 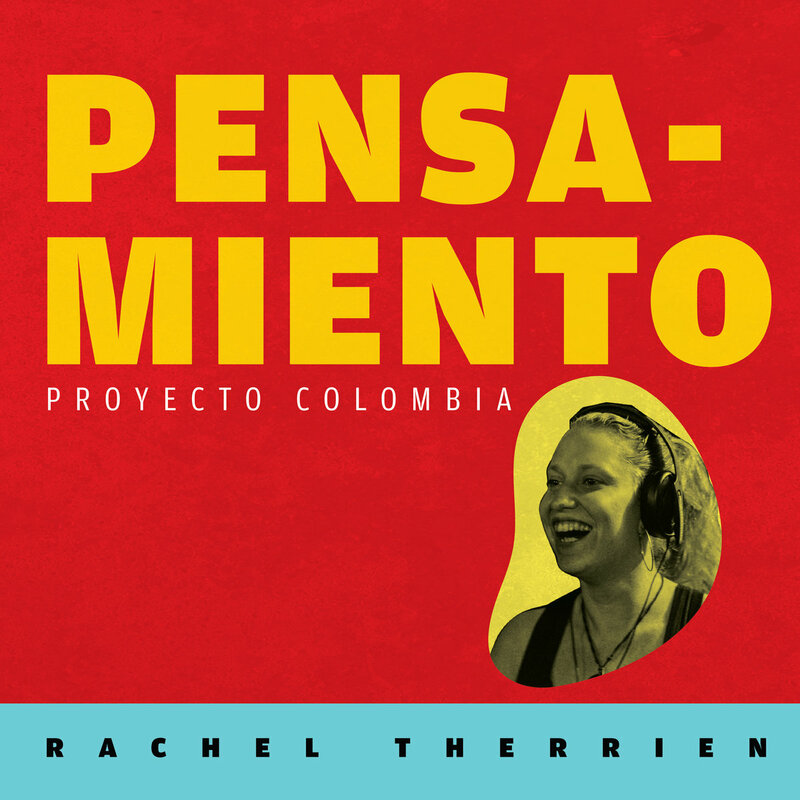 Trumpeter Rachel Therrien in 2014 went on a national tour of Colombia with the Gypsy Cumbia Orchestra, and was exposed to the broad spectrum of its national music, resulting in Pensamiento, recorded in its totality in Colombia, exclusively with local musicians. The record opens with the characteristic African derived mapale drumming long associated with Cartagena on the Caribbean coast, and is the principle percussive reference applied throughout. “A Ver,” is a tamborito structured number, with its origins in the folkloric dances of Panama, widely popular in the northern border region of Colombia. Therrien combines modern jazz with the streetwise beats of reggaeton rap on “Red Leaves,” as it evolves into a clave defined jam between her on trumpet, and saxophonist Jacobo Velez. Therrien lived and studied in Havana, so she knows the music, especially the Cuban son, which is as prevalent in Colombia, as anywhere in the Caribbean basin. “Por Que Me Pegas,” is her take on this prominent form, pianist Holman Alvarez and trombonist Mauro Castillo supplying the perfect accompaniment and emotions required. The mapale beat is revised on “Mapale 2: Prende La Vela,” though this take has full instrumentation, and is more dance oriented, performed at a frenetic pace. The Spanish flamenco essence is highlighted on “Flamenquillo,” guitarist Carlos Peralta, stepping into the forefront, laying out strong jazz oriented passages. Therrien keeps the jazz mood going on “To John,” as Alvarez returns on the Fender Rhodes for a classic fusion interpretation. The marimbas, so prevalent in the Pacific region, are the foundation for “La Guagua,” where Santiago Jimenez plays deftly on the tres (3 pairs of strings each tuned to the same pitch) guitar. The title track maintains the marimba background, as Afro-Colombian chants summon the spirits to clean and sharpen the senses, wishing for wisdom and clear thoughts (pensamiento). It is fascinating how Therrien, a native Canadian, wound up in Colombia, traversing across a cultural and musical landscape. All of the compositions presented here are originals, her sense of melody and harmony layered upon a complex percussive foundation, portraying a musician of extraordinary caliber. It not only takes talent to accomplish a production like this, it also requires a lot of courage and confidence to pull it off. Rather than blending her jazz inclinations into provincial modes, she became immersed in the music, losing herself, becoming an intricate part of the experience. Track Listing: Mapale 1; A Ver; Red Leaves; Por Que Me Pegas ? ; Mapale 2: Prende La Vela; Flamenquillo; To John; Ravia; La Guagua; Mapale 3; Pensamiento. Personnel: Rachel Therrien: trumpet, composer, arranger, producer; Jacobo Velez: sax, voice; Carlos Peralta: guitar, voice; Holman Alvarez: piano, voice; Javier Pinto: bass, voice; Ramon Berrocal: drums, voice; Ferney “La Wey” Segura: percussion, marimba, voice; Juan Carlos Arrechea Mina: percussion, marimba, voice; Humberto Barrios Madiedo: percussion; John Edward Arrechea Mina: percussion; Juan Carlos “Chongo” Puello: percussion; Santiago Jimenez: tiple/tres, voice; Mauro Castillo: trombone.